When choosing a Dent Repair technician, it is important to consider whether the technician you choose is capable of repairing your dents to the highest possible standard. This photo (above) was taken while repairing a hail damaged car for a customer. It highlights two dents. The first dent at the top of the image was created by a hailstone in a recent storm. The other dent, at the bottom of the photo, is an attempted repair by another Paintless Dent Repair technician. The poorly completed repair shows the damage that an inexperienced technician can do to a vehicle’s panel. If it was repaired properly, the panel would have been restored to its original condition, leaving no traceof the dent. While many people attempt to learn the art of Paintless Dent Repair, few ever reach the level of expertise held by our team at PDR 2U. With many years of experience repairing dents in a diverse range of vehicles, you can rest assured you will be receiving a professional service each time your car is repaired by one of our technicians. Our team at PDR 2U always strive for perfection and proudly stand behind the quality of our repairs, offering a lifetime warranty on all Paintless Dent Removal work done on your vehicle. 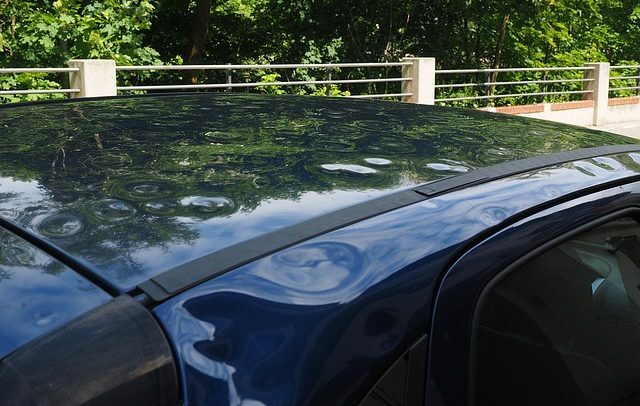 Fortunately for this customer, PDR 2U’s experienced technician was able to repair both of these dents perfectly, along with the rest of the hail damage, torestore the vehicle to its original condition. This case demonstrates why it is important for customers to research their repairer to ensure they receive the highest quality service. 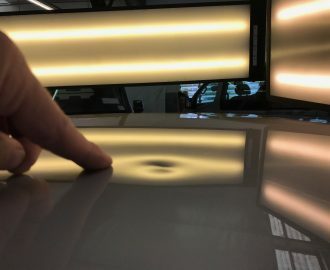 You may have seen videos on the internet of “hacks”, showing people repairing dents in their cars themselves using no more than a bucket of hot water, dry ice or a set of cheap tools they purchased online. 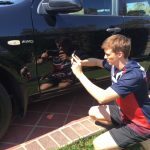 While these techniques may seem like easy and cheap ways to repair dents, please remember, if it seems too good to be true, it probably is. The first and most common alternative to using a highly trained technician that we regularly hear about from customers is that they purchase their own tool kit online and try to fix their dents themselves. This usually ends in disaster as they end up with damage worse than they had when they started! Late night infomercials and online ads promise amazing results, but they fail to show the damage left behind when an untrained enthusiast tries to repair a dent with basic tools. In contrast, when a professional Paintless Dent Repair technician repairs your dents, their trained eye and comprehensive knowledge about how to manipulate panels provides a precise result. Furthermore, a trained dent technician is able to use tools and techniques far beyond what comes in a repair kit ordered online, ensuring your dent is repaired properly and completely. Many customers also try pouring boiling water over their dents or placing dry ice on them to push their dents out themselves. While these techniques may sometimes work for removing very large dents from plastic panels, they are not recommended for smaller dents or dents in metal panels. These types of dents are more difficult to fix and required a trained professional. 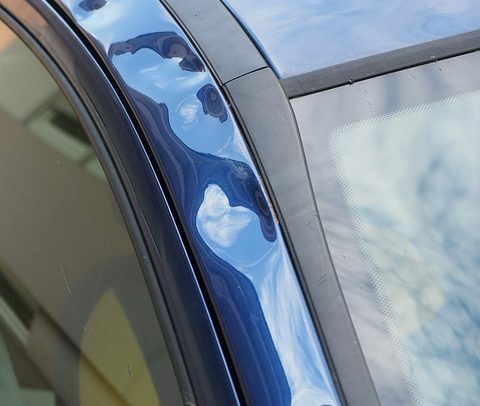 Furthermore, the boiling water and dry ice tricks often leave behind smaller dents and creases that can only be repaired by a Paintless Dent Repair technician. Our Paintless Dent Repair technicians at PDR 2U have undergone many years of training and practise to hone their skills. 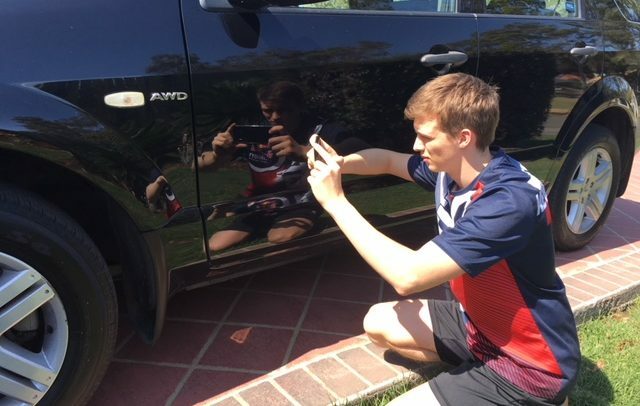 While many people attempt to learn how to fix dents in their cars, few people put in the time and effort to master the art. When you have your dents repaired with PDR 2U, you can rest assured you will be receiving a professional service carried out by a highly trained technician. Furthermore, all Paintless Dent Repairs come with a lifetime guarantee. PDR 2U offers an efficient and convenient mobile service, meaning that we fit in with your schedule! Our mobile repair unit is able to repair your dents on site while you wait, with most dents being repaired within one hour. Dents can be repaired at your home, place of work or almost anywhere else you could imagine! Our Paintless Dent Repair service area includes Brisbane, Redlands, Logan and the Gold Coast. Paintless dent repair was invented in 1960, by Oskar Flaig. During this time, Oskar was working with Mercedes at the International Motor Sports Show in New York, where he was responsible for the maintenance of the vehicles on display. Each night, Oskar would assess all of the cars for imperfections including scratches, chips and dents caused by visitors of the show, repairing them before floors opened the next morning. Oskar tried many techniques to help remove the dents in the display cars, but eventually found that massaging the dents out of the panels with the handle of a hammer provided the best results, often returning the panels to their original condition! 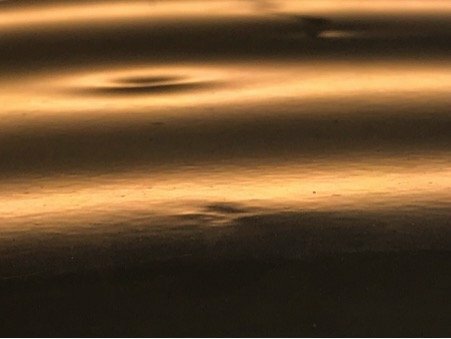 Oskar has since been known as the father of Paintless Dent Repair and techniques used to this day are still largely influenced by those originally created in the 1960’s. Yes, we work with your insurance company! PDR 2U has the ability to repair your vehicle in the event of an insurance claim. Having a professional service that you know and trust can put your mind at ease, knowing that your vehicle is in good hands. Additionally, choosing PDR 2U to repair your vehicle means that your car will be restored to its pre-dent condition, with a lifetime warranty on all Paintless Dent Repair work! Paintless Dent Repair technicians can repair dents all over your car. Our PDR technicians at PDR 2U have a range of tools and techniques, which can be used to repair dents in virtually every location on your car. PDR technicians are able to work on your car from the inside and the outside, meaning that there is no dent an experienced technician should be unable to reach. Furthermore, our technicians are able to remove and reinstall interior trimmings and fittings, allowing them access to those hard-to-reach dents. Paintless Dent Repair is cheaper and faster than you thought. When you think of getting your car repaired, you may imagine dropping your car off at the panel beater and then organising a loan car for the duration of the repair or trying to convince your friends and family to give you a lift. Our Paintless Dent Repair technicians at PDR 2U are able to arrange a time and place for your dent to be repaired that is most convenient for you. Whether it be at home, work or anywhere else you may decide, our fast and efficient mobile service can come to you! Most dents can even be repaired onsite within an hour. 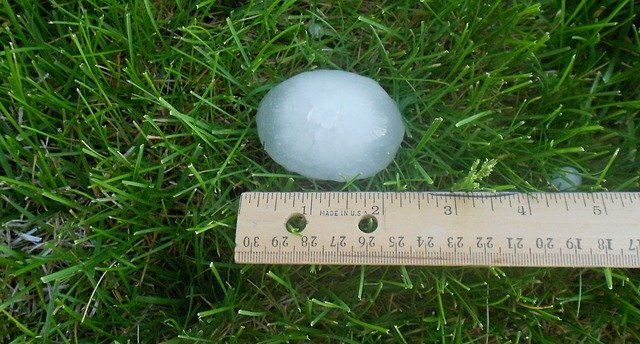 If your vehicle has hail damage, a complete hail damage repair with PDR 2U will only take a fraction of the time that a conventional panel beater would. Paintless Dent Repair techniques use the ‘shape memory’ of your car’s panels. When cars are manufactured, their panels are stamped out into their final shape. When a panel is dented, this shape is distorted. Paintless Dent Repair uses techniques to manipulate the dented panel back into its original shape, leaving no trace of the original dent!